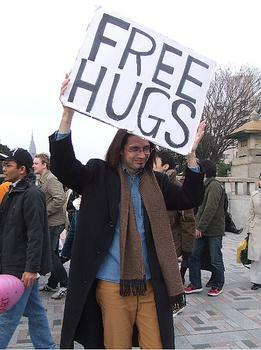 Juan Mann - Free Hugs Campaign. Web 2.0, and its culture of collaboration and sharing, has given rise to a new group of students. No longer just consumers of culture, they are producers of culture. Born into a digital era where everything is social, everything is available, and everything can be shared, they often come into today’s classrooms and experience a kind of culture shock. They find classrooms that look not unlike those of their parents’ time. More underfunded than ever, schools struggle to meet the needs of students and teachers. What is the answer? One answer might well be to look into the culture of sharing and collaboration that is all around, look for what is free or almost free, look to the same place that students are to engage them with the tools of their trade. Ideological, technological, and economical forces have converged to make the Internet a virtual goldmine of seemingly limitless, authentic, and relevant resources free for the taking. Free resources provide tremendous opportunities for educators and educational institutions. Yet, all free resources are not the same nor is the definition of free as straightforward as it might appear. While most tend to think of free as “without cost” (gratis), others believe passionately in the unencumbered right to free (as in liberated) knowledge. Educators and scholars through the ages have fought to keep cultural knowledge and information free. In order to help educators understand the different types of resources available, the Cost of Free project will attempt to define the meaning of “free” and explain how others have used, and are using, the term. The project analyzes the different types of free materials available to educators and learners (Open Source Software, Free Software, Freeware, Shareware, Free with Advertising and Freemium) as well as examines the implications of their use in education so that educators can utilize the tools of this generation and make wise educational choices. The project aspires to be a go-to repository for the different types of free software available for education. Educators also need to be aware that although free resources represent a potential goldmine, they can also be a minefield. Everything - even free- comes with a price. By providing a detailed evaluation template for the various criteria to be considered when adopting free solutions, the project enables educators to improve their ability to make wise decisions. Additionally, the project outlines the evolution of the Free Culture and the Open Source movements, Creative Commons and Copyright /CopyLeft licensing, including an assessment of their relevance to teachers and students. The digital era has blurred the boundaries of copyright. This project hopes to provide insight into the debate on what needs to be free. To navigate the pages users can either take a step by step journey or jump in anywhere, sampling a little from here or there. We hope you have a happy and enlightened journey….Welcome to The Cost of Free! And if our warnings about "free" are not heeded here, beware! This site was originally posted on the free site Wikispaces at https://cost-of-free.wikispaces.com/. It had a happy "free" life there for 8 years; but in July 2018, Wikispaces closed down. The whole site was painstakingly recreated here by Karen Hamilton. That's the cost of Free! Cost of Free was created for EPS 415, Technology and Educational Reform, Summer 2010 for the Master's program CTER at the University of Illinois. The team members from Toronto, Illinois, and the British Virgin Islands are Karen Hamilton, Debbie Plested, Mary Rezk, Andrew Jenkinson and Emily Brand.